Use a smartphone, tablet or computer to receive alerts and remotely monitor temperature and humidity levels. This system includes a 6 ft. dry temperature probe that allows for an additional temperature reading. Use a smartphone, tablet or computer to remotely monitor temperature and humidity levels that affect your home, business, vacation home or rentals. Protect your property. Prevent frozen pipes, mold growth and food spoilage. This system includes a wireless sensor that measures ambient temperature and humidity, a 6 ft. dry probe that measures air or soil temperature, and a gateway to enable remote monitoring. Monitor indoor temperature and humidity with the sensor and outdoor temperature with the detachable 6 ft. dry probe. Receive e-mail and text alerts for temperature and humidity readings outside of your parameters, connection loss and low battery charge. I was looking for a wireless thermometer that I could place in the crawlspace below my house. I set this thermometer probe with humidity sensor next to my water pipes and pressure tank so that I could monitor the temperature. I am able to use the mobile app on my phone to check the temp and humidity at any time and place. More than once I have noticed that the humidity was too high and I had to vent the space. A big thanks to the La Crosse for helping me know that my water is not going to freeze and I wont have mold growing. The Log feature is great because it allows me to see the changes over time. I am very pleased with the thermometer. Setup is easy and the batteries last a long time. I recommend this product for anyone that needs to know temp and humidity values wirelessly. 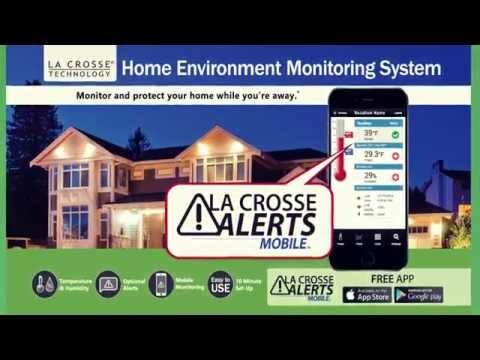 "Very satisfied with La Crosse Alerts!" "great for when we travel"
Thanks for the excellent customer service today! The Lacrosse Alert system is the ideal system for our lake home here in Western Montana. We like to travel to warmer climates in the winter, and the Alert system lets us know if the temperature in the house is getting a bit low. It has saved us from broken pipes more than once. I highly recommend this system for absentee homeowners.